Having run Salida 10 minutes quicker than in 2010 two weeks ago, I was hopeful that I could put up another course PR this weekend in a 50k, this time on the fantastically scenic outcropping of mountains lifting out of The Great Salt Lake, forming what is known as Antelope Island - a place where the buffalo roam and the antelope graze. Even better than the fauna are the dawn views of the stunning Wasatch off to the west of the island - alone worth the price of admission. But there was also some racing to be done. With Salida still in my legs and the American River 50 upcoming, I was a little unsure about racing this one too hard. I knew that the winner from the Bear 100, Mike Foote, would be on the start line but beyond that there weren't too many other names that I recognized from the start list. I was hopeful therefore that I might be able to cruise this one and still come away with a win. From the gun, I was on the deck being trampled after a somewhat inglorious drop of my EFS Liquid Shot flask and subsequent stumble to the ground after trying to scoop my fuel from the ground in stride. In my rugby days, I think I would have pulled it off, as scooping a rugby ball while on the move is a skill that is frequently practised, but it's been a while. In the process of falling, I dropped my water bottle under me and landed my ribs hard on it in exactly the same spot as I bruised them last year whilst coming down off of Pikes Peak. Another set of bruised left ribs as I sit here writing this. Sweet. Wheeze. After the stampeding, I was able to get to my feet, shake off the fall, and get on with the 32-mile task at hand. Last year, Scott Dickey set an uncomfortably hard pace up the opening 600-foot climb; this year, thankfully, the pace was very casual which allowed for some good banter and a gentle warm up. Christian Johnson, who paced me in expert fashion through the final 25 miles of the Wasatch 100 last year, was up in the lead pack of five or six guys as we climbed through the first couple of miles. He made a few introductions, singling out Seth Wold as a 'fast marathoner,' while Jake Krong introduced himself as a newcomer to the SLC area, just as we were starting to ratchet up the tempo toward a more race-like effort. Mike Foote and another whose name I didn't catch were also in the pack. After a quick wrong turn - approved by Christian who mapped the course, ahmm - we cut cross country back onto the jeep track that wound around a ledge before starting the descent down on the connector section between the two loops that together make up the 25k lap that done twice makes up the 50k course. On the steepest section of the lap, a short but sharp 300-400 foot climb up to the Elephant Head aid station, I could feel that my climbing legs were not with me. Six miles in, and this little grunter felt way harder than it should have. Seth (making things look way too easy), me (realizing that I was in for a long day), Jake, and Christian in third and fourth. Photo: Greg Norrander. By this point Seth, Jake and I had created some separation on Christian and Mike, and it looked like it would be the three of us racing for the podium places. Seth and I had mainly been taking turns with the lead and all three of us seemed on board and comfortable with the pace. I led us through the switchbacks at the far end of the Elephant Head loop, and I could tell that Seth and Jake were still running well within themselves. While I wasn't laboring up this climb, which is very generously graded (long switchbacks), I continued to feel like the climbing was more work than it should have been. Connecting back up to the first loop, I let Jake and Seth gap me a bit as the grade steepened. I was able to catch up quickly as things flattened out, but by this point 11-12 miles in, I was beginning to feel like I was in for a grind of a second lap. Finishing up the rolling last few miles of the first lap on the return side of the first loop back to the turnaround at the start/finish, Jake assumed the lead and upped the tempo a touch - maybe feeling Seth and I out a bit. This work actually felt good and I was enjoying the increased blood flow that accompanied the faster pace, which gave me some encouragement that my legs might finally be ready and up to the task of racing the second lap. We hit the turnaround, after the long downhill cruiser into the finish area, in 1:49 which I think was a minute faster than last year. On the climb back up for round two, I knew immediately that I was in trouble. Jake and Seth kept the effort level right where it had been for the last few miles, and despite the feeling that my legs had opened up a touch through the rollers of the last couple of miles, I just couldn't get them firing on any kind of sustained climb. I hung on for the first half of the climb, but soon made the executive decision that I just wasn't going to be able to hold this pace without an inglorious implosion long before the finish. And so I let them go. By the top of the climb, Jake and Seth had 45-60 seconds on me. I figured I might be able to pick them back up on the flatter/downhill stuff, but it wasn't to be. After holding out hope for a few miles, it became increasingly clear - on this course with wide open, sweeping views - that they were gone. Knowing by Elephant Head at mile 21-22 that the racing was essentially done, I dropped down into training mode and started thinking about American River and the fact that I will need to be careful with the mileage and effort over the next couple of weeks if I want to be at all competitive there. Flat legs again and there is no way I'll be competing. Coming back around toward the finish with three or four miles to go, after passing probably 100 people in the 25k race ("on your left," "coming up behind you," "on your right, "right behind you guys," "nice work"....), I caught sight of Seth five minutes or so ahead, which was closer than I thought he would be at this stage. However, with the proliferation of 25k runners between he and I, it was unclear if Jake was ahead or behind him. In the vain hope that I might be able to pick up second, I increased the tempo for the final 20-25 minutes, but it wasn't to be. I ended up coming in a touch under 3:48, which was a few seconds quicker than last year (in comparable conditions), but way off Jake's new course record of 3:38, which given the 4,000 feet of climb, 4000-5000' of altitude, and long course (32-32.5 miles) is pretty impressive (at least to me). Seth - a 2:22 road marathoner - also finished way under my time from last year (3:43). Clearly, I need to be a little careful as I get ready for American River, which is something of a goal race. I didn't feel great at Salida, but came away satisfied with my run. Yesterday on Antelope Island it was a grind pretty much the whole morning, which tells me that it's time to take things a little easier for the next couple of weeks - a mini taper in the middle of my build for Western States. Hopefully that way I can run well at AR50, while also recharging the batteries a bit before the last six or seven weeks of work before Squaw. Elsewhere on the island, Coloradoans Dan Vega and Dylan Bowman held up their ends of the bargain with impressive wins in the 100- and 50-mile races. Dan beat Mr.100 himself (Meltzer) in the inaugural 100, while Dylan reset Burch's 6:30 course record from last year with a zippy 6:15. Both these guys look to have found good early season form - and both will be running at Leadville in August. Put them both in your picks for the top five. Defening Leadville champ Duncan Callahan also had a good run in the 50, finishing in 6:30 or so. Good luck with your training and races this season. Sounds about like my race report. Big one in two weeks! Noticed you have some extra spacing in between paragraphs, you having issues with blogger jacking up the spacing too? I had to edit my post four times to get it right. Scott - yeah, Seth seems very light on his feet. I could tell early that he'd probably beat me unless he bonked. Kind of the way I felt running against you last year. I told him after the race that he needs to start getting serious again to snag a spot for the OT qualifiers next year. Ultras can wait. JM - yeah, not sure what's up with the spacing. Didn't have time to deal with the line break coding when I put this up. Fixed now. Nick - great run yesterday. Awesome meeting you and running with you. Good luck the rest of your season... I'm sure our paths will cross again sooner rather than later. 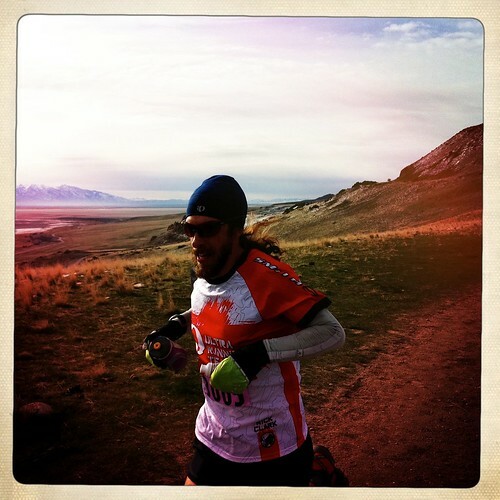 And if you need a pacer for Wasatch 100 this year, I'd be stoked to run with you. nick, way to grind it out man. always enjoy your race reports. hope you get well-rested and refreshed heading into AR. Pleasure meeting you Nick. Solid work out on the island. It's not always easy to keep your ego and racing goals in check. Really looking forward to watching AR from the sideline in a couple weeks. Give em hell out there. Jake - congrats again. Look forward to following the rest of your year. Unfortunately, no Wasatch 100 for me this year. Jacob R - thanks, man! Really looking forward to AR50. Scott, Ryan and I are planning to run a few miles on the WS course Sunday morning (we're staying in Auburn) before our afternoon flight back to CO. Would be cool to have a local guide...guess a lot of that will depend on recovery, although I'd like to out and back to Hwy 49. Dylan - congrats again. Hope you rethink Jemez. Three weeks is a good amount of recovery time, but you're probably wise to limit to 50k. Kristel - I realised soon after we crossed that it was you, but I think you were out of earshot by the time it registered. Looks like we're bringing home two bronze medals to The Fort - congrats! It was great catching up with you (after the race). Congrats again on a great run and tune up for AR50, looking forward to seeing your results from that one. He should have never stopped running, he ran that 2:22 in his first season. He might be out of time now. It's so hard to get back to that kind of form after a break. I might see you at the JFK 50 this year. Scott - still plenty of time. He may not be in prime marathon shape right now, but based on his run this weekend, I'd hardly say he's out of shape. Four or five months of dedicated training from that base would be plenty of time. The hard part is finding the time, motivation and disicipline. Nick- I imagine I'll be pretty beat up, but would love to join you guys for a robie to no-hands and back, or something along those lines. definitely chat more come AR, rest well. Nick, Sorry about the lack of course markings. Usually I do it myself, but this year relied on someone else to mark the course. That coupled with the rain/snow on Friday made for markings that were less than what I would have liked. Thanks for coming out and running again. 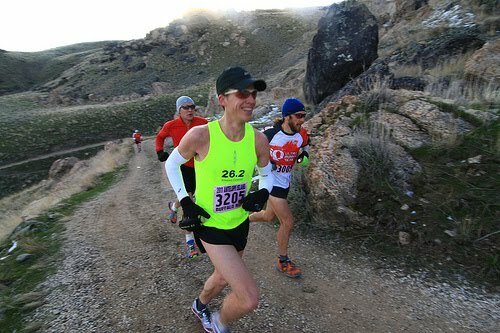 When I saw that Seth was racing, I knew that the men's 50K was the race to watch. I think I could manage to run the course in about twice your time. Hope to see you around at some o0ther races this summer and hopefully back out on the island. Jim - no worries on the markings. Between Christian and I, we had the route covered. Thanks again for another awesome morning on the trails. Antelope Island is a unique and beautiful place, and you do a great job of promoting it. Solid run for tired legs! Faster than last year is always good. Rest up for AR - looks like it should be a fast one! Nick, you are probably right. If anyone could pull it off, it would be Seth.